From generations past to the present, aging has been viewed as a dreadful monster that comes to steal your beauty and health away so we spend time and money looking for solutions and hopefully you're doing so within the organic body care. Before you know it, aging creeps in, then wrinkles and age spots start to develop or become more prominent, your body starts to ache, gravity checks in and things aren’t as tight as they use to be. The obsession with aging and how to prevent it has been around for centuries. It can be traced back to the 16thcentury, when Spanish explorer Juan Ponce de Leon was rumored to have discovered Florida while searching for the fountain of youth. The idea that there is a fountain of magic waters that can restore youthfulness with one sip seems a bit far-fetched. I believe in what seems to be a proven fact, if you lead an active and healthy lifestyle and are conscious of what you put in and on your body, you can slow the effects of aging. Apparently, I’m not the only person who believes in this statement- most people do, which is why you see so many businesses within the cosmetic industry attaching “anti-aging” to their product labels. Although there will always be consumers who buy into “anti-aging” products simply because the packaging says “anti-aging”, many consumers are becoming more knowledgeable of which ingredients actually helps slow down the process of aging. An ingredient in particular that has been dated back to Greek myths such as Homer’s Odyssey as a beauty elixir is Helichrysum. Helichrysum (arenarium) is a flower which produces an essential oil known to have great skin rejuvenating, anti-inflammatory and cell-regenerative properties. 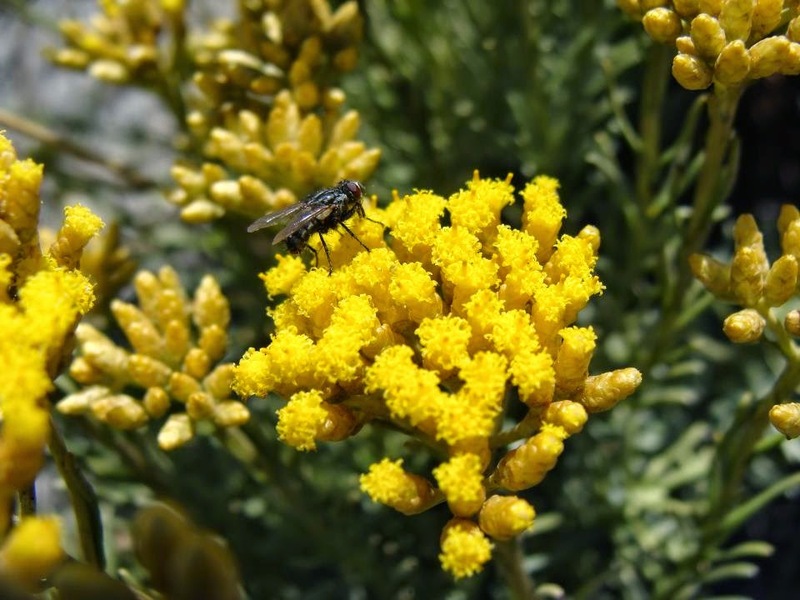 Helichrysum is also known as Everlasting and/or Immortelle, because it retains its shape and beautiful yellow coloring even if plucked and dried. Just imagine what those properties can do for ones skin. This flower grows in the European and Mediterranean regions amongst sandy, dry, and rocky areas. Skin aging, as defined by the National Center of Biotechnology Information, is a complex, multi-factorial process whose baseline rate is genetically determined but that may be accelerated by environmental, mechanical, or socioeconomic factors. The intrinsic structural changes that occur with the aging of the skin increase skin fragility decrease the ability of the skin to heal, increase risk for toxicological injuries, promote the development of various cutaneous disorders, and produce aesthetically undesirable effects like wrinkling and uneven pigmentation  . The amazing healing properties of Helichrysum, include the ability to help reduce free-radical oxidative damage, stimulate cell regeneration, reduce the appearance of scars, stretch marks, dermatitis, and acne, as well as tone and tighten skin that has reduced elasticity – all which are issues of maturing skin. As wonderful as the essential oil of Helichrysum is, it is not commonly seen in many beauty and/or organic body care products. I relate this to the fact that pure Helichrysum essential oil isn’t easy to get in large quantities nor is it cheap. Although it’s an expensive essential oil, the medicinal properties are exceptional and definitely well worth the price. The benefits of Helichrysum essential oil used in organic body care is not just limited to consumers who are dealing with issues of aging skin, scars, eczema, dry skin, but it’s great for preserving and maintaining the beauty of young vibrant skin as well. It has also been known to contribute to healing properties of the liver and nervous system according to the aromatherapy industry. It’s never too early or too late to begin caring about the health and maintenance of your skin and we’re encouraging it by incorporating this amazing essential oil into most of our formulations. The fountain of youth lies within all of us – it’s our outlook on life, it’s the decisions that we make regarding our health, it’s the ability to consistently possess a positive outlook on life. So the next time you look in the mirror, and become terrified that the monster known as “Aging” is coming to get you, remember one thing, YOU HOLD THE POWER.